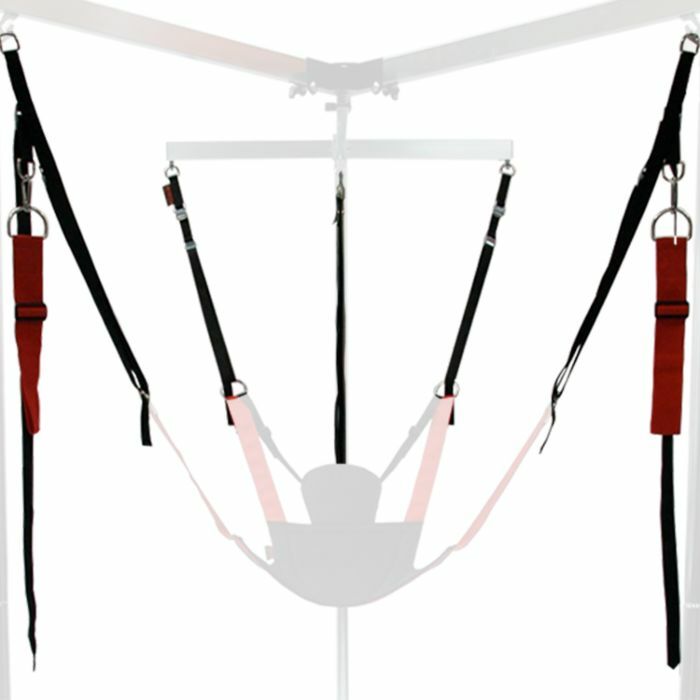 The RED Multi-purpose Adjustable Sling Frame Strap Set is a unique strap system to connect a RED Sling to a RED Sling Frame. This set of straps allows fine adjustment in height during use without the need to disconnect and it can be adapted to just about any suitable length. This top quality sling frame strap set offers a myriad of configuration options so you can find the perfect position no matter how you use your sling and sling frame. Four additional straps complete with carbine hooks are supplied to support and restrain the wrists and ankles when desired. These can be configured in any direction to achieve the required effect. Here at UberKinky we think the best benefit of using this adjustable sling frame strap set is its silent operation—no more clinking chains to wake up the neighbours. The RED Multi-Purpose Adjustable Sing Frame Strap Set includes four main straps with a pair of cam buckles on each and four restraint straps with four 6mm carbine hooks. The maximum recommended working load limit of this strap set is a whopping 400Kg, (100Kg on each strap).